Earn up to 520 reward points. Hear what you need to hear clearly without ear-damaging levels or outside distractions. Direct Sound Extreme Isolation Headphones are used by Terry Bozzio, Shawn Drover of Megadeth, and they're Blue Man group approved. The Direct Sound EX-29 headphones let drummers hear both mix and acoustic drums clearly at ear-saving levels. Now drummers can record "live" drums right next to their mixers; Front-Of-House engineers can monitor comfortably during live performances; studio musicians can finally hear the cue mix over loud instruments; engineers can use them for mic placement, and DJ's can isolate one ear and hear both CD and loudspeakers clearly for beat mixing. What makes Direct Sound EX-29 sound isolation headphones so extreme? Specially designed earmuffs passively attenuate surrounding sound by a comfortable average of 28 decibels throughout the sound spectrum. With custom-fitted speaker assembly, the speakers are designed to protect your eardrums from damage and improve your recording and performance experience. A frequency range of 20Hz-20kHz and advanced an-isotropic magnet drivers offer superior fidelity and sensitivity. 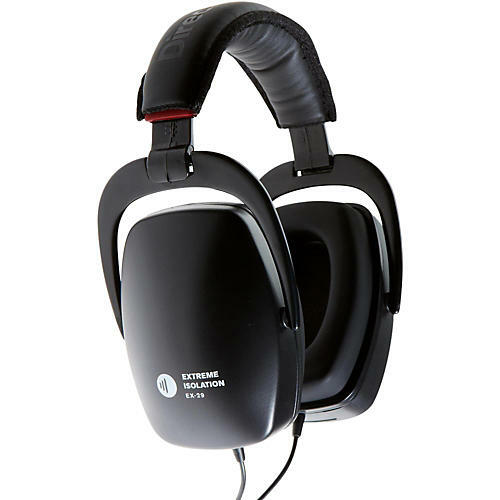 Direct Sound EX-29 Extreme headphones fold for easy storage. Convenient dual cords are worn behind the head, which prevents them from interfering with your hands or instruments. Not just for drummers, Direct Extreme Isolation Headphones are great for project studios, stage and studio musicians, sound engineers or for solitude at home. Type: Dynamic closed back speaker within a Closed Back Isolation Chamber. Save yourself time and the frustration of stopping to listen to takes and retakes in the control room while protecting your ears.